Those of you who have been following this blog for a while know about my interest in the Shakers, a religious group that worshiped a godhead with male and female aspects, and practiced celibacy and communal living while awaiting the End Times. This last weekend, I was on a trip visiting some buildings that were once part of the Shaker village in Tyringham, Massachusetts. The Shakers founded about twenty communities, of which only one survives. 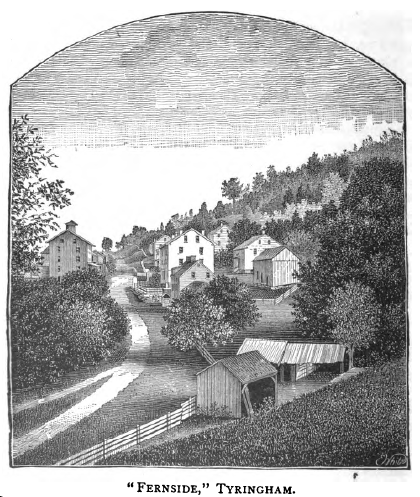 Tyringham was one of their smallest communities, barely reaching 100 people at its height. After 1850, the Shakers went into a decline, and began closing villages and selling them. Tyringham was the first to go, in 1875. There are a lot fewer Shaker buildings than there once were. As they declined in numbers, the Shakers began pulling down buildings as they ceased to need them, to reduce their property taxes. Once they closed a community and sold it, the people who took over altered or demolished the buildings as they saw fit. And not a few perished in fires or by simple neglect. So there aren’t that many Shaker buildings left. 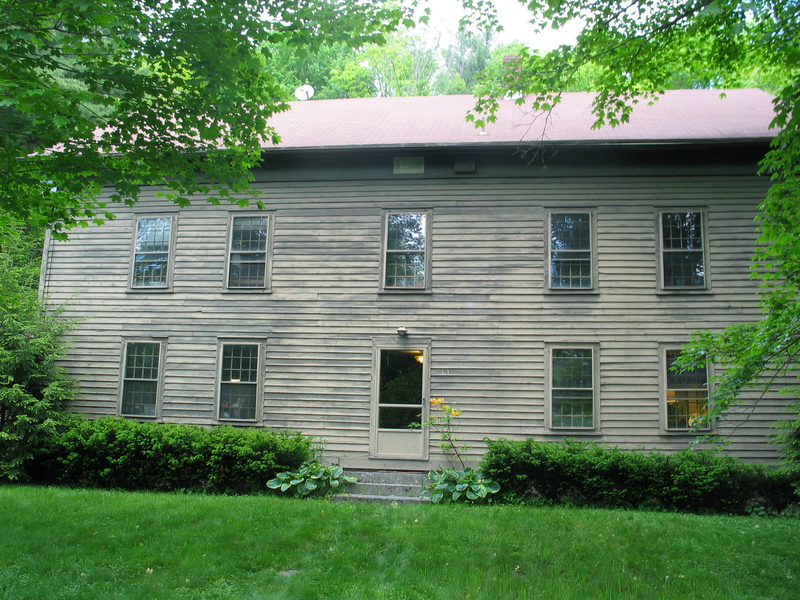 Some Shaker buildings are part of museums and are open to the public on a regular basis. Others are in government or private hands, and Shaker scholars and fans can visit them only when the owners are willing to receive visitors. So there’s a certain prestige in Shaker circles to be able to say you had the chance to visit a building that has rarely been opened to visitors. 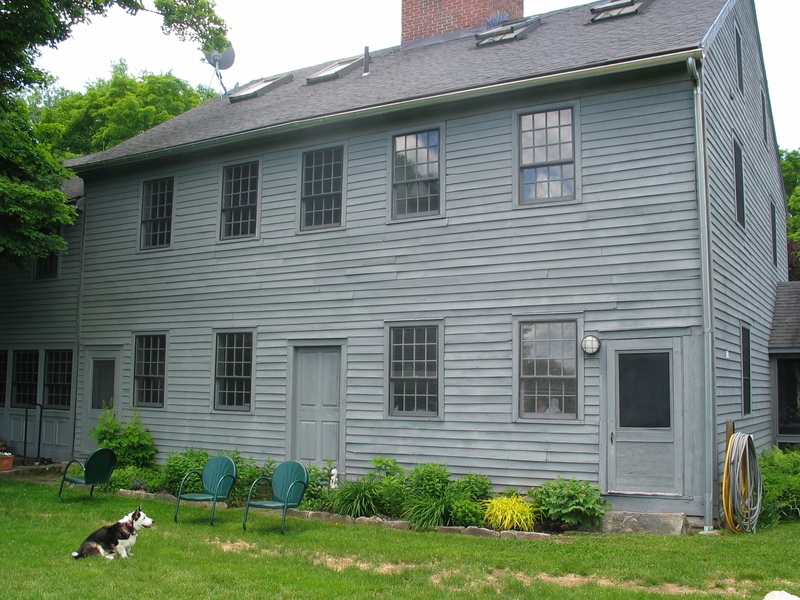 My own favorite such experience was my first trip to the former Shaker village of Shirley, Massachusetts. To visit, I had to reserve a place in one of the trips organized by the Shirley Historical Society. On the day of the trip, we were picked up at the Historical Society by a prison van! You see, these Shaker buildings were on the grounds of a maximum security state prison, and prison officials did not want a bunch of antiquarians running loose on the grounds. Anyhow, back to Tyringham. All of the surviving buildings are in private hands. So it was fortunate that the owners of two buildings both agreed to let the Boston Area Shaker Study Group visit on the same day. Indeed, they were enthusiastic hosts, and let us wander freely around both buildings and their grounds. Prior to the Civil War, the Shakers conducted a major trade in seeds. Indeed, they were the first to package seeds in envelopes and sell them. Tyringham was one of the villages with a large business in seeds, so they had a large Seed House to store and prepare the seeds for sale. This Seed House would be even larger, but it was moved off its original foundation and downhill to a new site, losing a floor in the process. Later, in the 1950s to 1980s, the building was the residence of Jean Brown, who amassed one of the largest collections of Fluxus and Mail Art in the world, which was of particular interest to E.J. So we both had things to talk about with the current owners. One of the most important buildings in every Shaker village was the meetinghouse, where the Shakers in their heyday conducted a worship service open to the public every Sunday. It was there that the Shakers engaged in their famous group dances, in which the male and female Shakers would dance together in intricate patterns, without coming into contact with each other. Like the Seed House, the Tyringham meetinghouse has also been moved from its original site. The current owners of the building are proud enough of its Shaker heritage; indeed, their daughter has written a novel set among the Tyringham Shakers during the period of intense spiritualist activity of the late 1830s and 1840s. Besides seeing Shaker buildings, we also had dinner and ice cream with an old friend of mine from graduate school whom I hadn’t seen for some time. And on our way home, we spotted a doe and her fawn together on the grassy strip between the highway and the woods. Combine that with perfect weather, warm and dry, and it was a good day’s trip! This entry was posted in History and tagged Fluxus, History, Shaker village, Shakers, Travel, Tyringham. Bookmark the permalink. Seems like a lovely and productive day trip. Indeed. The Shaker scholars felt they’d seen enough to make a convincing argument about whom the architect of the meetinghouse was, while E.J. got an invitation to go back and see more of the Mail Art. As usual, I learned a few things from reading your post, BB. Enjoyed this one very much. Oh, and a hello from CP below in the comments for you. The pregnancy rate was low enough that the Shakers can be called effectively celibate. There were scandals, everything from pregnancies to, more commonly, Shakers eloping together. Oddly enough, eloping couples were often quite old, in their 40s. 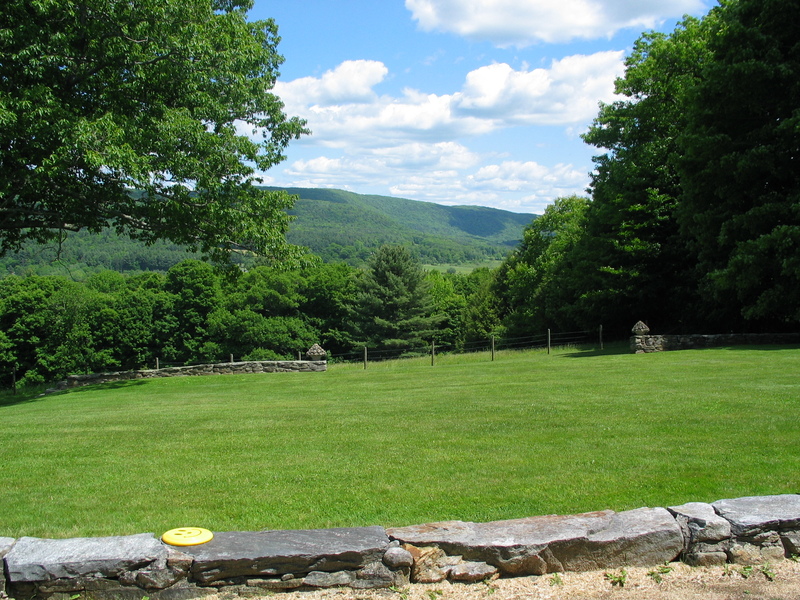 Today, the visitor could be forgiven for wondering if the Shakers chose their locations for scenic beauty. Sabbathday Lake, Canterbury, Enfield (N.H.), Tyringham, Hancock, Mount Lebanon, Pleasant Hill, and South Union all have idyllic settings today. Of course, the Shakers had to work for their living in those settings, which made them less charming. And some of the charm of the ponds at Canterbury is lost when you realize they are artificial, created to provide water power for now-dismantled factories. It’s just good to have you back online. Oh, and I will, my dear friend…Thanks!